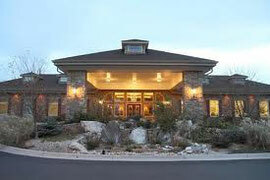 Just as a diamond is a precious stone, Stonebrook Manor reflects a "Diamond in the Rockies." The Ballrooms feature castilla chandeliers suspended above elegant grand staircases, stylish fireplaces and granite dance floors. Both Ballrooms have their own private sunrooms with built-in granite top bars, outdoor patios, mezzanines and state-of-the-art audio and visual systems. Outside, breathtaking sunken gardens with lush landscaping, waterfalls, and hand crafted marble gazebos create the picture perfect backdrop for an outdoor wedding ceremony.